Overview: Redesign category page with the primary goal of increasing conversion and allow users to easily browse and find the products they want. Overview: Recruiters often express concern that in order to read a job seeker’s information they have to download the resume because the thumbnail is too small to read. By simplifying design layout, and using all real estate to show the resume, the Responsive Site project created site performance needed by the recruiter for its improved function and clarity before download. Overview: Increase app retention by sending users push notifications when there are new candidates. Overview: Premium clients usually have a busy schedule, therefore being efficient is important for them. This app allows users to jump to any section by tapping a keyword, giving them the option to navigate through highlighted sections only. The non-linear experience is a much more efficient way to read the important part of a report than a traditional PDF format. Overview: J.P. Morgan Private Bank wanted to create a responsive website for different regions. My design is consistent with the corporate branding as well as provides a modern and premium feeling in order to match the high-class private bank consumer’s profile. Overview : iHeartRadio is an Internet radio platform owned by Clear Channel Broadcasting, Inc. The challenge is to maximize the iHeartRadio iPad app user experience by creating a design that builds on the iPhone presentation, and accounts for a larger screen size. 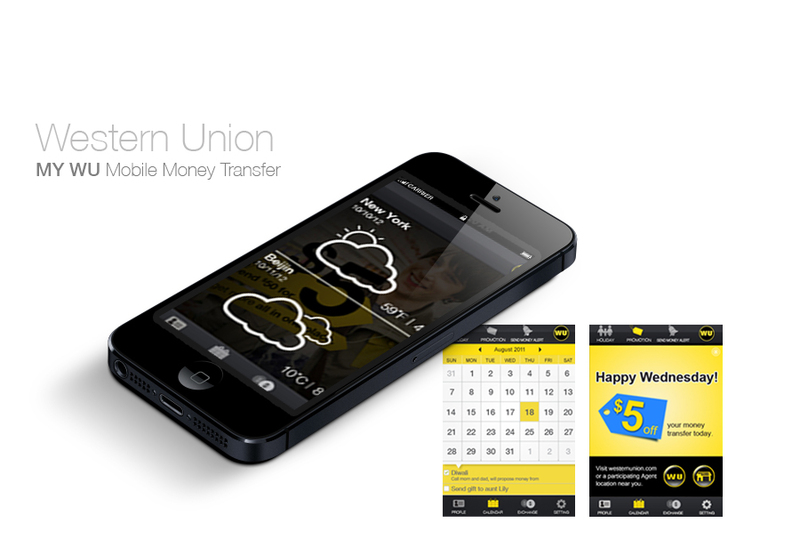 Overview : Western Union is an extensive money transfer service company. We co-operated with Morock, a main stream advertising agency, as well as other international agencies to develop integrated advertisement. Overview : DISH is a satellite TV programming provider. I developed 360。communication messages over several years through different channels such as newspaper, DM, grassroots advertising, online banner, and social media. Overview : Undertone offers online advertising display and video advertising services that allows businesses to target ads to specific locations, demographics and keywords.